The hunt for Flight 370, which vanished on March 8 during a trip from Kuala Lumpur to Beijing, is complicated in just about every way imaginable, from the vastness of the search area to its distance from land to the brutal weather that plagues it. But for all the fancy technology on board the planes and vessels scouring the swirling waters, the best tool searchers have are their own eyes. They stare out at a punishingly unbroken expanse of grey water that seems, at times, to blend into the clouds. Occasionally, they press their foreheads against the plane's windows so hard they leave grease marks, their eyes darting up and down, left and right, looking for something -anything - that could explain the fate of the missing Malaysia Airlines plane. Those eyes can spot things man-made equipment cannot. But they are also subject to the peculiarities of the human brain. They can play tricks. They can blink at the wrong moment. They can, and often do, grow weary. "It is incredibly fatiguing work," says Flight Lt. Stephen Graham, tactical coordinator for the crew on board a Royal New Zealand Air Force P-3 Orion that has made six sorties into the southern Indian Ocean search zone. "If it's bright and glaring obviously sunglasses help, but there's only so much you can do." Search and rescue makes up a small part of what Graham's squadron does, and visual spotting is an even smaller subset of that. But everyone on board has had to learn how to do it - and it's not as simple as most people think. Graham learned as part of a yearlong training stint in Canada, further refined his skills during a six-month course in New Zealand and has had ongoing training since. Crew members have to know what they're doing, because the electronic equipment on board sometimes doesn't. "The P-3 has a lot of really advanced sensors and they're really useful in our other roles, but for search and rescue, when you can't guarantee a large or a metallic target, vision is the best that you've got," Graham says. Inside the shadowy confines of New Zealand's P-3 Orion, the spotters drop into their seats, which they swivel toward the window and inch forward before leaning into the bubble-shaped windows that extend outward from the plane, permitting them to see straight down. When the oils from their skin smudge the window, they wipe away the marks with eyeglass cloths. There are two spotters on either side of the aircraft. They rest their elbows on a padded shelf, their binoculars sitting at arm's reach. A small pocket near each window contains safety manuals, paperwork and a handful of barf bags. On at least one particularly bumpy flight, the crew had to use them. They don't have to have naturally perfect vision; Graham, for example, sports brown thick-rimmed eyeglasses and admits his eyesight isn't as good as it once was. But they do need to be able to correct it to 20/20 with contacts or glasses, and they must exhibit excellent attention to detail. That's because even the tiniest detail could signify their target - white objects, anything angular that might be man-made, anything orange - since aircraft items that are designed to be located are generally yellow or orange. Some of the seaweed in the search area is bright orange, causing hearts to briefly race when it comes into view. They're trained to constantly move their eyes - in an X pattern, or up and down - whatever keeps them alert, says Ron Bishop, who once trained spotters and was formerly second-in-charge of the U.S. Air Force Rescue and Special Operations School at Kirtland Air Force Base in Albuquerque, New Mexico. Still, the monotony of the sea can do funny things to the eyes. "When your eyes sit at a single focus, they do seem to lock into that and it's very easy to glaze over and start missing things," Graham says. "So one of the things we're trained to do is just shift your focal point - so look at the wing tip or look inside just for half a second and then out again, and try and keep your mind active." No one on board is a designated spotter; everyone rotates positions, which is the best weapon against fatigue. Thirty minutes in the seat is ideal, but they can go up to an hour. Longer than that, Graham says, and effectiveness starts to wane. Breaks are critical in order to prevent them from slipping into a haze, much like a passenger who starts to daydream while staring out the window, Bishop says. "As humans, we're not really good monitors, we're not really good at sitting in a control room and watching for the gauges to move," Bishop says. "And that's really what you're doing with search and rescue and recovery is you're looking for something." On a recent flight over the search zone, the U.S. Navy's P-8 Poseidon flew in slow, straight, parallel sweeps, scanning the ocean below with both radar and the spotters' eyes. "Now we're just mowing the lawn," said Lt. j.g. Kyle Atakturk, describing the monotonous search pattern. A crew member finishes up a one-hour stint at the window, his last for the day. He swivels around in his seat, sitting motionlessly for a moment, face drawn, eyes bulging. Finally, he blinks, shakes his head, and then stands up and walks it off. Although the crew is kept well-fed and hydrated, there are few opportunities for genuine rest periods, Graham says. Whenever a spotter finishes a shift at the window, another job awaits - from navigating to tactical coordination. Rotations are done during the few minutes when the plane is turning around after a sweep, and spotters don't move from the windows until another crew member is standing directly behind them, ready to slide into their seat. The weather further complicates their jobs. When it's calm and the seas are glassy, anything unusual is easy to spot. When the wind is up and the waves are high, the added motion and color from the whitecaps are a distraction. The speed of the aircraft, too, means there is little time to verify what an object is before it has slipped from view. 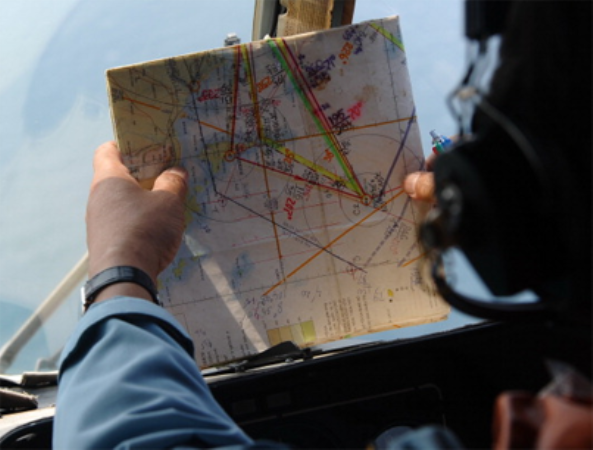 Such factors have made the hunt for Flight 370 a logistical nightmare. On several occasions, planes and ships trying to get a closer looks at objects that another plane has spotted earlier have failed to find them. "There are stories (in other searches) of people trying to relocate somebody even in a life raft - which is a fairly large and colored target - and needing six or seven passes to get the aircraft back on top of it," Graham says. The job can be tedious, but then there's an unbeatable rush of adrenaline when they catch a glimpse of something below. Chatter picks up pace and volume. Hearts pound. "Thinking about that is what keeps you going over what can be really, really long and quite dull missions at times," Graham says. "Is it going to be behind this next wave?" The search for Flight 370 remains a huge, complex mission, but for Graham, it's not an impossible one. They have hunted for tiny targets across massive areas before. And sometimes in the haystack, the needle emerges. "You might be looking for a single canoe in the vastness of the Pacific and we do find them," Graham says. "So there is always hope."